Bulgaria is undermining the authority of the Southeast European Law Enforcement Center (SELEC), of which the country is a member under a ratified international agreement. This emerged from Friday media appearances of the Chief of the Special Prosecutor’s Office Ivan Geshev and the Chief of the Main Directorate for Combating Organized Crime (GDBOP) Ivaylo Spiridonov, as they both denied that bitcoins worth billions had been seized in a joint investigation against customs fraudsters six months ago. 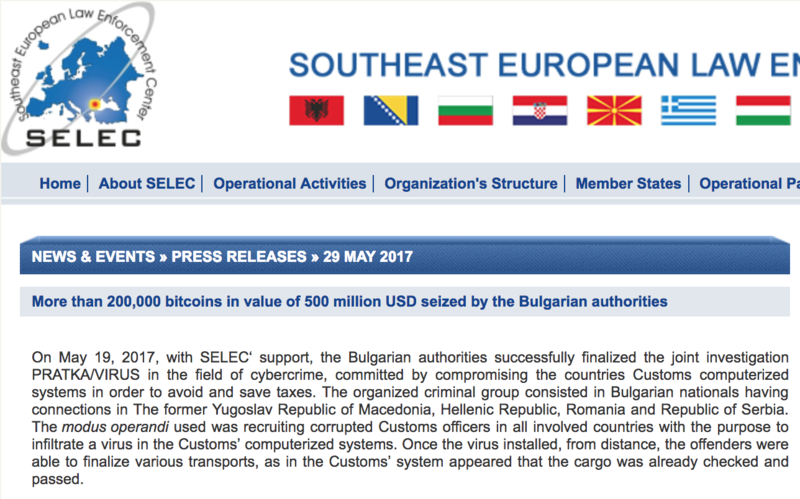 On May 29, 2017, SELEC announced on its official website a large-scale international investigation – PRATKA/VIRUS, in which Bulgarian authorities have seized more than 200,000 bitcoins worth more than USD 500 million. The announcement identifies the criminal act committed in acquiring the bitcoins and their exact number – 213,519. Currently they are worth about USD 3.5 billion (at the December 9, 2017, rate). “There are no seized bitcoins in this case,” Geshev adamantly stated. He then embarked in confused explanations that owning bitcoins was not illegal, and the prosecution was not dealing with “people’s hobby” to mine bitcoins. However, proceeds from criminal activity are within the jurisdiction of the Prosecutor’s Office and, under the Penal Procedural Code, when seized, serve as evidence in court, no matter the currency. The SELEC website announcement in English does not leave room for any doubt that there has been a seizure of virtual wallets containing such an amount of the popular cryptocurrency. What is the Southeast European Law Enforcement Center and what is it doing? The SELEC Convention was ratified by a law adopted by the National Assembly in 2010. The organization’s members are mainly Balkan countries, and it has a diplomatic status and works under the Europol model, whose activity is supported by regional investigations and operations. SELEC is based in Bucharest and is funded by its member countries. The privileges and immunities of the Center are also ratified by a special law. It is important to emphasize that SELEC handles classified information and operational data that are entered into a special information system. According to the Convention, SELEC coordinates regional operations and support investigations and crime prevention activities of the Member States in trans-border cases; provides the Member States with the opportunity to exchange information and criminal intelligence and offer operational assistance in a quick and timely manner; collects, collates, analyzes, processes and disseminates information and criminal intelligence; produces strategic analysis and threat assessments related to its objective. Bivol asked the Interior Ministry under the Access to Public Information Act (APIA) to explain how is it storing these bitcoins and requested to make the wallets’ keys public in order to prevent any possible abuse. The Ministry of Interior refused to provide any information, citing criminal proceedings non-disclosure. SELEC’s Secretariat did not respond to our inquiries for information. The Bulgarian media ignored the information until yesterday, when it was reported by the CoinDesk site, which cited SELEC and Bivol’s publications. Carefully avoiding quoting Bivol, without analyzes and serious questions, the big national televisions joined the action to whitewash and refute the official SELEC information. However, this smoke screen does not negate the question of what is the correct institutional information – SELEC’s announcement, which has not changed since May 29, or the yesterday refutation by the Ministry of the Interior and the Prosecutor’s Office? In both cases, however, we are witnessing official Bulgarian institutions undermining the authority of the “Balkan Europol”, as SELEC can be termed. Earlier this month, it became known that SELEC has been approached by the Turkish Organized Crime Service, KOM, over the issue of smuggled cigarettes produced Bulgarian tobacco manufacturer Bulgartabac. A report has been sent to Interpol as well. Two weeks ago, Bivol also came up with the premise that the Interior Ministry might have misled international partners by misrepresenting information on the seized bitcoins in order to brag before them about its great success. However, if SELEC’s information is correct, and there are bitcoins, its denial by a leading prosecutor and the GDBOP Head, already constitutes a crime and an attempt to conceal the largest theft in the history of cryptocurrencies and in modern Bulgarian history.